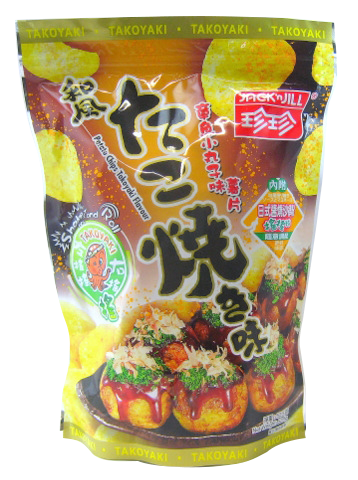 Potato chips takoyaki flavor: Potato, vegetable oil, takoyaki flavor (sugar, flavor enhancer [E621, E631, E364], maltodextrin, soy bean sauce, salt, seafood powder, soy sauce powder, spices, yeast extract, anti-caking agent [E551, E341], flavor, color ([E160c], sweetener [E951]), antioxidant (E320, E321, E310). 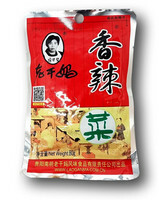 Tonkatsu and salad dressing powder: Sugar, salt, whole milk powder, egg yolk powder, maltodextrin, yeast powder, mustard powder, acidity regulator (E296, E260, E262), flavor, anti-caking agent (E551), sweetener (E951). 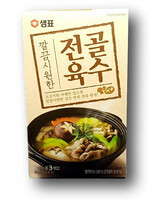 Contains soy, wheat, milk, eggs and mustard.